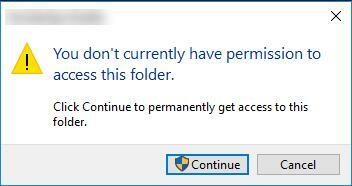 After Windows 10 upgrade, as long as you try to double click a folder or file to open it, Windows 10 always warns you with the error information saying You don’t currently have permission to access this folder. Even if you are logging on to Windows 10 with the administrator account, you still lose the administrator privilege to access, rename and delete folders or files. For this case, you would better get the permission to open folders as soon as possible. 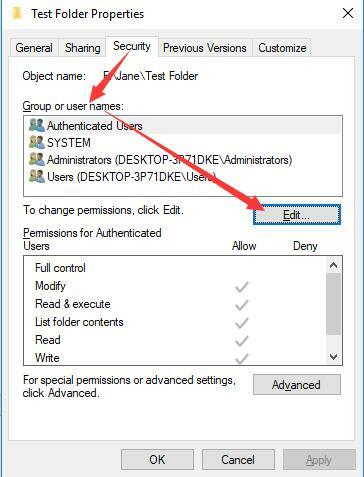 Everyone using folders or files knows there is an option for accessing the folder on Windows system, namely Read-only. It denotes that you can only read the content of the folder without editing it. 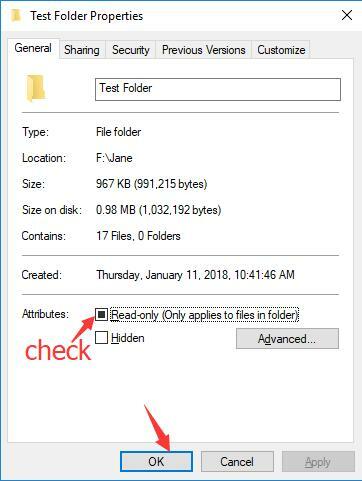 Therefore, this Read-only option is a trade-off method for people who feel like to retrieve the folder or file without delay and changing it. 1. Right click the inaccessible folder to open its Properties. 2. 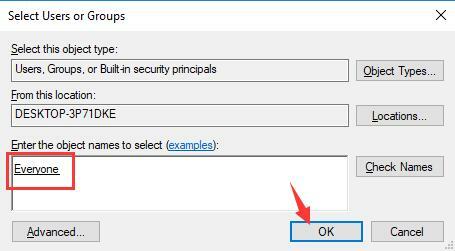 In Properties, check the box for Read-only and then click OK to save changes. Now you can take the ownership of the folder and open it. But just as you have been reminded, this way can only help you read it, if you would like to get the administrator permission for it, move on. It is widely reported that Windows 7/8 users have permission to fully control the PC folders, files, etc. But immediately when you upgraded to Windows 10, you have lost the permissions to folders, for your access has just been denied. The user or group was removed from Group or user names on the folder’s Security tab. That is what Microsoft has explained the permission error on Windows 10. Granted that, you may as well manage to give the administrator authority to access folders and files in folder Security. 1.Right click the inaccessible folder to navigate to its Properties. Here open Test Folder Properties. 2. 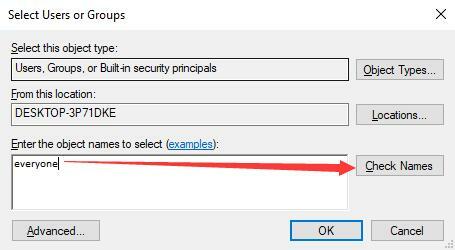 Under Security tab, locate Group or user names and then click Edit. 3. Click Add on the following window. 4. Under Enter the object names to select, type in everyone and then click Check Names. 5. Windows 10 is checking the name you have just input and correct it to Everyone for you and then stroke OK.
6. 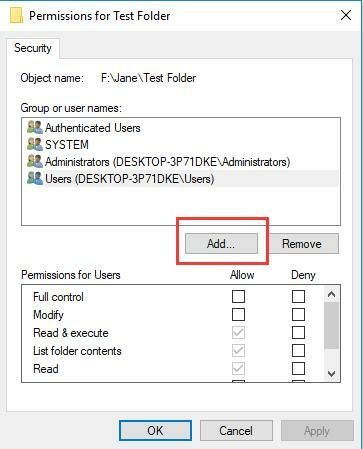 On the pop-up Permission for Folder window, check the box for Allow to Full Control the folders and then hit Apply and OK one by one. 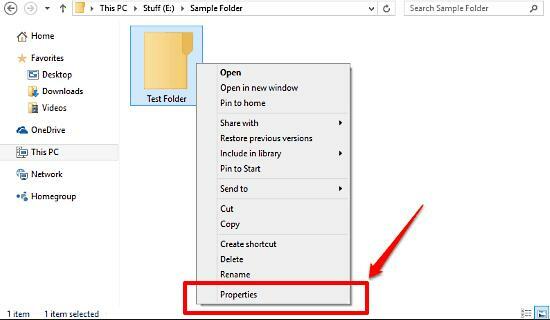 After closing the Properties window for the folder, you can try to double click the folder to see if it is available for you this time. For most cases, it is possible that you have gained the permissions to access the folder on Windows 10. It is obvious that the way above focuses on single or more folders without ownership or permission on Windows 10. While if you have no permissions to considerable or all folders, you must figure some ways else out. Or sometimes, you are reminded that The currently logged on user does not have ownership privilege. The Command Prompt would be a good Windows tool for you to get the administrative authority or permissions to access folders or files on Windows 10. Especially when there is a conflict between share permissions and New Technology File System (NTFS) permissions. 1. Type in Command Prompt in the search box. 2. Right click the best-matched result to Run as administrator. 3. In Command Prompt, input the command: TAKEOWN /F <type in the path of the folder that you want to take access>. Here you must make sure you have found the right path storing the folder. Or the Command Prompt cannot find it. Windows Command Prompt is able to win the permissions for folders and files on Windows 10. Now you are free to access or edit the content in the folders. 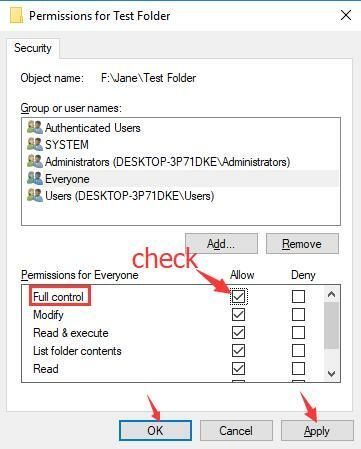 Maybe with one way in this post you are enabled to get the full permission to open the inaccessible folders on Windows 10. And if so, you may like to change your user type and permissions for your PC.